NASHVILLE, Tenn. — The Sabres can’t stay healthy, and it’s making the Amerks sick. Injury-plagued Buffalo summoned two more players from Rochester on Thursday as Rasmus Ristolainen and Johan Larsson joined the team for its game against Nashville. The Sabres have six players who would be in Rochester if the NHL club was healthy, and it’s taking a huge toll on the minor-league team. The Amerks are winless in their last eight games and have fallen out of a playoff spot in the American Hockey League. They are in ninth place in the Western Conference, one point behind Rockford and Charlotte with 10 games remaining. The Amerks are on an 0-6-2 slide, and they took just six shots through the opening two periods of Wednesday’s 3-1 setback to Milwaukee. In addition to the two most recent callups, Rochester is playing without Buffalo goaltenders Nathan Lieuwen and Matt Hackett, left wing Nicolas Deslauriers and defenseman Chad Ruhwedel. The Amerks also have injury problems with forward Jamie Tardif and defenseman Mark Pysyk among the missing. 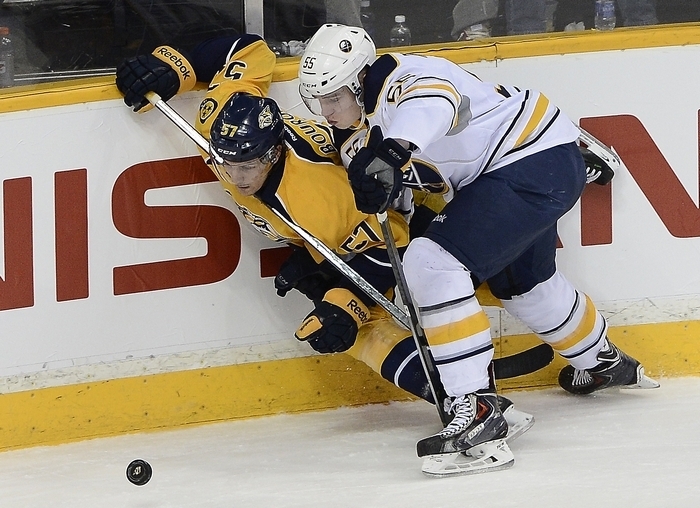 “It’s not the best situation, but they have to figure it out and play better,” Ristolainen said. While the Sabres would prefer to have Rochester make the playoffs, they have little choice in their recalls. They can’t promote second-tier players who don’t deserve it, so the Amerks’ better players are up because Tyler Myers, Zemgus Girgensons, Jhonas Enroth, Michal Neuvirth, Chris Stewart, Alexander Sulzer, Torrey Mitchell and Zenon Konopka are out. The first two games - Tuesday against the Devils and April 8 against the Red Wings - will feature autographed jersey giveaways to 26 season-ticket holders, a 40 percent discount in the Sabres Store and reduced prices on select concessions. The traditional “Fan Appreciation Night” will be held April 13 during the season finale against the Islanders. There will be a party in the plaza at First Niagara Center from 2:30-4:30 p.m., players will give select season-ticket holders the jerseys off their backs following the 5 p.m. game, and 2,000 balloons will be dropped from the rafters, with hundreds containing prize coupons. Buffalo is also hosting a contest at Sabres.com in which two winners will receive tickets to the game against the Islanders, and they will compete to win four round-trip airline tickets from Delta Air Lines. Fans watching the finale on television can win a pair of season tickets for 2014-15 and an autographed jersey by scanning a QR code that will appear on the screen during the broadcast. The Sabres have announced season-ticket prices for the Amerks for next season, and it will be interesting to see if the big club goes with a similar pricing plan. Prices are going up $1 per game to $15, but fans who renew before April 18 will get a discounted rate of $13 per game. The last-place Sabres, who announced a 97 percent renewal rate last summer, likely will need to offer renewal enticements to their followers with another loss-filled season expected in 2014-15.